According to Neftegaz, chairman and CEO of Total Patrick Pouyanné in a recent presentation confirmed that the first shipment of LNG from Russia’s new grand gas project is to be conducted «before October». Originally, Novatek leader Leonid Mikhelson wanted the historic shipment to take place in connection with his birthday 11th August, Neftegaz writes. That schedule, however, appears too tight. In a meeting with President Vladimir Putin in November 2016, Mikhelson promised that the project will be online in fall 2017. «I believe, in exactly in one year, we will invite you to attend the loading of the first LNG-carrier», Mikhelson told the president. «The project is progressing excellently». It is most likely the «Christophe de Margerie» which will carry the load. The brand new 299 meter long LNG carrier, built in Korea, in early February left Zeebrugge, Belgium, with a test load of LNG. On 12th February the ship entered the Kola Bay with course for Murmansk. Two days later, it continued its voyage eastwards for ice testing in the Gulf of Ob. The ship carries the name of the former Total leader who died in a Moscow plane crash in 2014. The «Christophe de Margerie» will be able to handle shiploads up to 172,600 cubic tons of liquified natural gas. It will have ice-protection level Arc7, and capacity to autonomously break through 2,1 meter of ice. According to shipping company Sovcomflot, the LNG tanker will have engine power of 45 MW, which is «comparable with a nuclear powered icebreaker». A total of 15 carriers of the kind are to be built for the Yamal LNG project. When in full swing, the Yamal LNG will produce an annual 16,5 million tons of liquified gas. 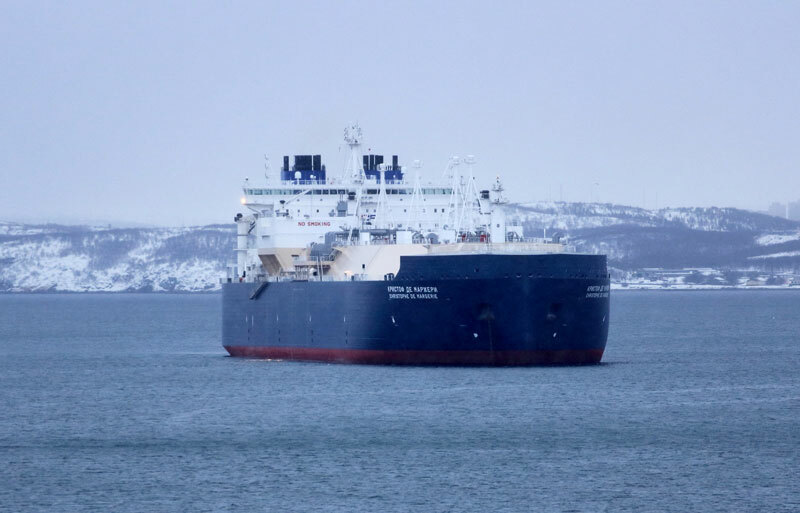 The LNG will be shipped to buyers both in Europe and Asia, parts of it eastwards along the Northern Sea Route. The Yamal LNG project is operated by licenseholder Novatek (51%). Partners are French company Total (20%) and Chinese companies CNPC (20%) and Silk Road Fund (9,9%).